County Wicklow, with its moorland wastes and bare granite hills has a wealth of lovely valley, wooded glen, and smoking waterfall. Dean Swift likened it to “a frieze mantle fringed with gold lace”. Much of the coastland is low, being a drift covered plain, fringed from Wicklow to near Greystones by a shingle bank known as “The Murrough”, but the ancient court quartzite’s rise westwards to form the fine conical hills of the Great Sugarloaf (1659ft) and the Little Sugarloaf. 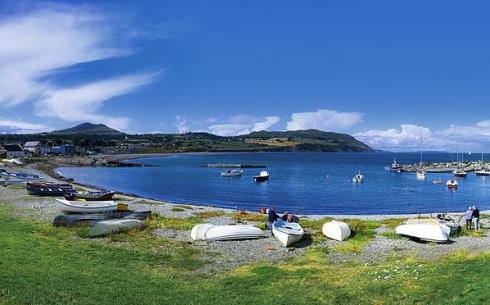 Greystones, a quiet holiday resort and residential district, lies in a pleasantly wooded part of the Wicklow coast, a few miles south of Bray Head, and 18 miles from Dublin. It retains in part the atmosphere of the former fishing village, and at the same time its wide tree-fringed roads, well-trimmed hedges and modern residences are an example of town planning at its best. Holiday-makers in Ireland may safely be divided into those who like the respectable urban amenities of an East coast town with sandy beach, cinema, badminton, excellent 18 hole golf course, and those who prefer the exuberant rough – and – tumble of the stony coastal parts of the West. There could, I think, be no greater contrast than between Greystones, in County Wicklow, and Roundstone, in County Galway. But Greystones has unquestionably this advantage – it lies within the dry coastal strip of the east where the annual rainfall is a mere 30-40 inches and the average summer temperature is just under 60 degrees, and the town has easy access to Wicklow’s finest scenery. Greystones is a must see attraction on your Ireland tours.